Britain must be prepared to intervene to prevent foreign states' "malicious negligence" of their own people, says Liberal Democrat leader Nick Clegg. The "unjustified invasion of Iraq" should not weaken support for "liberal interventionism", he said in a speech. He said the concept needed revisiting and expanding to cover non-conflict disasters like the Burma cyclone. And the UK should push development of the Responsibility to Protect doctrine in the United Nations, he added. 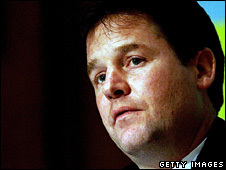 The concept - adopted by the UN - allows intervention if countries cannot or will not prevent abuses of their citizens but Mr Clegg said there had been an "ad hoc" approach to it. It ranges from diplomatic pressure and economic sanctions to military force as a last resort. In a keynote foreign policy speech at Chatham House, Mr Clegg said the UN should keep developing it, to make it "the first port of call to sanction an errant state" - so long as certain conditions are met. He said the "messy reality" of its military commitments, notably the war in Iraq, had put UK on "the back foot" when it came to humanitarian interventions. "Exactly at a time when we should be strengthening the doctrine of liberal interventionism, the legacy of New Labour's disastrous intervention in Iraq has weakened our political and moral authority to do so," he said. Britain needed to conduct a full strategic defence review to ensure its armed forces are ready for the "triple challenge of agile peacekeeping, humanitarian and counterinsurgency operations," he said. And while its priority should remain the security of the British people, it should be prepared to take a leading role in Europe's humanitarian deployments and to develop the Responsibility to Protect doctrine. He said there should be strict rules governing military interventions - that it be based on a just cause, have the right intention, always be a last resort, sanctioned by a legitimate authority, be "proportional" and "must have a reasonable chance of success". While there was a "moral case" for intervening in Zimbabwe - he said the fact there was no regional support for military intervention meant there was little chance it would be successful. Instead pressure should be put on the Mugabe regime in other ways, he said, such as cutting off access to foreign currency. But the case of Burma, where some foreign aid workers were blocked in the wake of Cyclone Nargis, showed the need to revisit the rules around Responsibility to Protect, he said. "If we are willing to take action to protect innocent citizens from state persecution I do not believe that it is morally right to abandon other citizens to the lethal and malicious negligence of their governments," said Mr Clegg. He said the international community should intervene "when a state intentionally permits extreme and unnecessary suffering that it has the power to stop". He also said while he was disappointed that Irish voters had rejected the EU Treaty, there was "no excuse for continuing on regardless". He said if there was "no obvious or simple solution, it would be better to let the treaty drop". He added: "The greatest danger to the European cause is not the loss of the Lisbon Treaty itself, but a prolonged period of political uncertainty and legal wrangling." So will Iraq be Blair's epitaph?